Tempeh is an Indonesian staple made from partially cooked, fermented soybeans, or other beans, that are pressed into cakes. The fermentation process gives tempeh a higher content of protein, dietary fiber and vitamins. Tempeh has a mild, nutty taste and absorbs flavors well. Tempeh is a probiotic food, which means it helps the body to produce the healthful bacteria. It also has antibiotic properties which help to fight the harmful bacteria. Tempeh is a complete protein containing all of the essential amino acids. It has soy isoflavones that strengthen bones, help ease menopause symptoms, reduce risk of coronary heart disease and some cancers. Tempeh maintains all the fiber of the beans and gains some digestive benefits from the enzymes created during the fermentation process. Tempeh cakes can be sliced or cubed, then marinated and baked, grilled or deep fried. It can also be crumbled for chili, or chopped and shaped into burgers. To soften tempeh and help it absorb flavors, steam or simmer in a marinade, broth or sauce at least 15 minutes prior to using it in a recipe. Unopened packages of tempeh can be refrigerated up to two weeks or frozen up to three months. Place in fry pan with small amount of olive oil and brown. Add: chopped onion, chopped jalapeno pepper, 1 tsp. Cumin, 1 tsp. Chili powder, ½ tsp. Garlic powder, salt and pepper to taste. Add a Tablespoon of salsa - use as taco filler. Combine olive oil, soy sauce, pepper Worcestershire sauce, barbecue seasoning and cumin in a medium bowl. Add the tempeh cubes and toss until well coated. Allow the tempeh to marinate at least 2 hours or overnight. Saute the cubes over medium high heat in a bit of olive oil until browned and crispy. Drain the cashews and combine in the bowl of the food processor with the lime juice, avocado, water and seasoned salt. Puree until smooth and fluffy. 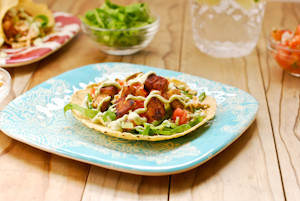 Assemble tacos with tempeh, cheese, lettuce, olives, salsa and top with avocado lime crema. Mix well. Serve cold or grilled on your favorite bread. ½ cup dry roasted cashews, chopped Salt & pepper to taste. Bring a pot of water to boil, cook tempeh in the boiling water to soften the flavor of the tempeh, about 5-10 minutes. Drain and cool. Place bread in a food processor and pulse until evenly crumbled. Transfer bread to a large bowl. Crumble cooled tempeh over bread crumbs, add the rest of the ingredients. Mix well using your hands. Form tempeh mixture into 1-inch balls. If mixture is to dry, add small amount of olive oil. They can also be fried on the stovetop in small amount of olive oil. These can be used in a marinara sauce, sweet sour sauce or any other type of gravy desired. Drain the tempeh that was simmered in water and place tempeh in a non-stick fry pan with a lid. Add the orange juice, soy sauce, ginger, garlic, turmeric and marmalade for 5 minutes on medium high heat with lid covered. Remove lid, turn down the heat and let liquid evaporate and caramelize. After most of the liquid is absorbed and only a sticky sauce remains, add a little olive oil to lightly brown and crisp up the edges. Add some sweet chili sauce and a dash of sriracha and heat. Serve tempeh over rice and broccoli. Add a slice of orange and sprinkle with sesame seeds for garnish.